This year is the first year in a long time that I've really had to think hard about what I would like for Christmas. It's tricky when you become a parent, I get far more enjoyment from buying things, or receiving gifts for the boys than I do myself. In fact, I loathe picking things up for me in comparison to shopping for them. Everything is just a little more exciting in mini version, right? But, as it does every year the inevitable 'What do you want for Christmas?' question has been shot at me numerous times and because I've genuinely not had time to sit and think for a moment, I've found myself giving the mundane reply of 'I don't really know to be honest'. 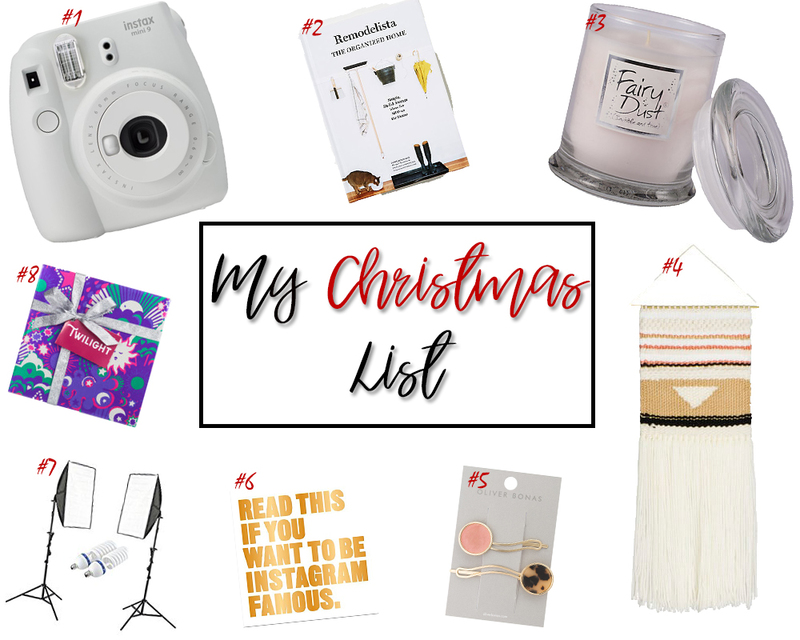 It's not a lie, because there isn't anything I desperately need and long gone are the days when I had time to search endlessly online or dedicate an evening to flicking through the boots gift guide. However, there are a some things that have caught my eye over the past few months. Though it's taken me a long time to fill up eight spaces with items because as life tends to be when you're an adult, you just buy the things you need and want, yourself. None the less I thought I'd share with you those little bits and pieces that I will be wishing for under the tree this year. 1- An instax mini - I've got my 'proper' camera so to speak that I use for day to day photographs, and of course a trusty Iphone that manages quick fix jobs but I really want a Instax, I've wanted one since polaroids because popular again but it's always floated to the back of my list as something more important has come along. This year though, it's top and how cute is the white edition? 2. Remodelista book - I have heard rave reviews about this organisational book, and January is always peak time for me to minimise and de-clutter, so this would be a perfect post Christmas read. It's quite a beautiful coffee table book too and I know would sit pretty on our kitchen sideboard. 3. Lily flame candles - Lily Flame candles are by far my favourite, their scent payoff is amazing and way above any other candle I have tried out, and believe me, there has been a lot. Fairy dust is a really sweet and delicate scent, it's not too overpowering but so distinct that I can detect it a mile off. The jars are pretty and they burn really well so I'd love another one of these to pop on my bedside table. 4. Wall hanging - I'm really into decorating our house at the moment, this year it's completely turned from a house to a home and it's something I'm proud of. It's been my project and will always be one that will continue as my taste changes all the time. This wall hanging is beautiful from Maisons du Monde, which is fastly becoming my favourite home ware store, it could replace our current monochrome on in the living room beautifully. 5. Hair grips - Being a Mum it's rare that I can a) have time to do my hair and b) be bothered to do my hair. Patricks thankfully past the age were he is grabbing fistfuls of it, but having long hair is completely inconvenient when you've got children - it just gets in the way. So, that being said I'm usually sporting some form of Mum bun or up do, and it's all a bit boring. These cute clips would add a little more something to the generic hair style. 6. Instagram book - I actually saw this Instagram book in Paperchase and thought it looked really funny, all in gest of course. However I've since seen this one on how to take better photographs and I think it would be an amazing read. 7. Lighting - Now I'm giving the blog my all as of the New Year, I need to invest in some indoor lights to shoot products. The winter has killed my vibe a little for photos and unless we're outside I tend to leave my camera to the side because the end result just looks a bit pants. With these lights I would be less limited. 8. Lush bath set - Would it be Christmas without Lush? Lush has definitely featured heavily in products I've bought for others this year. But I would really love a set myself, particularly the Twilight box as I know it has rave reviews. I'm not sure I need any help with sleep as of course, having children makes sure I'm in a permanent state of tiredness but every little helps.